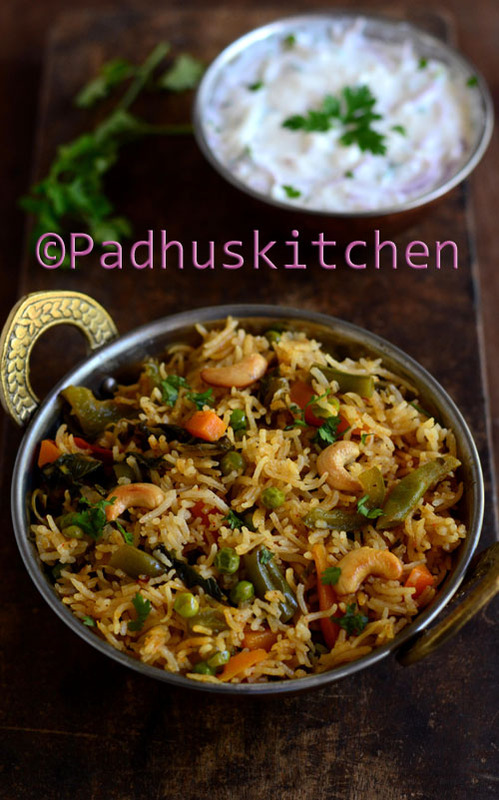 A very simple and easy Biryani recipe without much spices .This goes well with raitha, papads and chips. If you have all the vegetables cut and kept ready, then it hardly takes 10 minutes to prepare this. Even bachelors can prepare this as it requires no elaborate grinding of masalas etc. So bachelors out there, do not spoil your health by eating outside often, here is a simple and yummy biryani recipe that can be prepared at home in no time. We had this with mixed vegetable raitha and it tasted awesome. Today we will learn how to make vegetable biryani the easy way. How to prepare fried onions for garnishing -Cut onions into thin strips and fry it in oil until golden brown. Add it before serving. You can pressure cook keeping a vessel inside the cooker or cook it in a pan with lid or you can do everything directly in the rice cooker itself. Since I do not like to cook directly in the rice cooker, I did everything in a pan and transferred it to the rice cooker. Cooking Biryani in pressure cooker directly -After adding water to the rice, close the cooker without weight. Once rice is half cooked, stir the contents and close it with weight. Keep on low flame for 4-5 minutes and switch it off. Open after the pressure subsides and fluff it with a fork. Check How to make Biryani in Pressure cooker (another method with step wise pictures) or click the picture below to take you to that page. Do check my lovely collection of rice recipes. Delicious Biriyani, a complete Meal!!!! yummy biryani...konjam namma pakkaum vanthittu pongaPadhu! A one pot meal scrumpticious and so tsaty perfect with raita. I like when you add the fries onions to the rice..yummy! Biryani is an irresistible dish :-) Your recipe sound delicious! Never say no to vegetable briyani, my fav..
very yummy looking biryani! looks awesome! Biryani looks great. Nice and cute presentation. First time on your site and I love the props you have used in your pics of the vegetable carving. Biriyani looks simplified...every household has a diff way of making it!!! This is simply delicious...presentation as usual very nice. Like the presentation, Padhu. Lovely recipe. Thanks a lot... Tired this today... It was yummy. I am a bachelor and i tried your recipe it's really taste and it's easy to prepare also. If you are doing it in pressure cooker directly, then cook till 1 whistle, and then keep it in sim/low flame for 5 minutes.If you are a beginner,you need to be careful as there are chances (very less chance) of the rice getting burnt. Another method - keep it in a vessel inside the cooker .Refer my how to cook rice in pressure cooker.For that you can keep 3 whistles and switch off.Open only after the pressure subsides. Finally made tasty biriyani - thanks to your recipe! I think the trick is the lemon juice added to the water while cooking. Since I made this biriyani I have started adding lemon juice to pongal, and it just tastes great! Thanks for sharing. Thanks for letting me know .You have to add rice after add 2 cups of boiling water .I have updated it there also. mam your dishes r always suupprrbb....! Tried out and it is really awesome eventhough i only had as i am staying alone :) Will try when i got parents home and hope they will like it for sure..Didn't add cauliflower & potato as i was very hungry and lazy to go out and buy. tried the recipe first time and it came out well. THANKS PADHU, AS I AM A BACHLOR SO I RARLY COOK BUT NOW I AM ALWAYS COOKING BIRYANI FOR MY DINNER, BEST THING IS MY FREINDS NOW PREFER TO HAVE DINNER AT MY PLACE. Hi Padhu.. wanted to know what I can use if I don't get ready made biriyani masala.. is there any masala I can make at home for this? Hi Madam, although you have over-whelming comments here, my conscience doesn't allow me to go without adding a word here! Your catering presentation is very much appreciated and it helped me particularly in this Veg Biriyani recipe..Thanks a lot Madam. Keep it up..
Btw, what brand biriyani masala/pulav masala did you use for this recipe? hey thanks padhu, am a bachelor and i hope this will help me,. Thanks again! and Padhu, pls post some easy dishes which can be prepared easily !! thanks. Keep it up for variety of recipe. In Veg Biryani preparation Instead of boiling the cut vegetables along with other masala in water try with two cups of curd. you will have more tasty biryani. If cooking in cooker how many whistle should b given . If you are going to prepare biryani directly in the cooker, once you add rice and water, close it without weight .When the rice is half cooked, stir the contents and close the cooker with weight on. Cook on low flame for 4-5 minutes. Switch off. Open and fluff it with a fork. Delicious Veg Biryani is ready. Check out my post on How to cook Basmati Ricefor more details. Thank you so much Vandana. Glad you found my website useful. There is hardly any chances for the biryani to taste bitter. Probably you must have over fried the onions.That could be the only reason. Hi Padhu..Thanks for the recipe..It came out well.I always get my biriyani over cooked..I am never interested to buy fried onions.I will try to add up to my biryani next time. 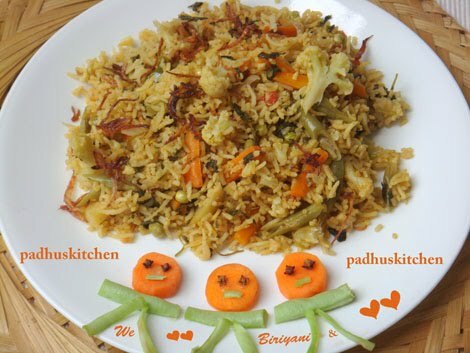 Your presentation is excellent ....I tried this veg biryani, its very tasty and also I tried most of your recipies, all came out well........Thanks Padhu. I just made veg biryani step by step of ur receipe... Result was absolutely delicious .... I also wanted to ask , my son is 22months old , if u cud suggest or give me any recipes it would be helpful .thank u -Nithya. Thank You!! It came out awesome!!! delicious.. Thank you for this lovely recepie, this morning i prepared this and i must say it was yummy... for the biryani masala I prepared at home and this added more flavor...i follow up posts on regular basis. The recepies that you have post are quite easy and can be prepared in just an hr!! I know you already have received many appreciations...but i could not stop myself from commenting....Thank you for your contribution towards this blog and making available on internet so that millions of users who are eager to learn cooking..this blog of urs works wonders!!! Thank for sharing Vegetable Biryani. I tired it at home as per the recipe guidance. But i want it to be more spicy, can you please suggest me which Indian spices i need to add more. I just followed this recipe and my Biriyani tasted great the first time itself... Thanks a lot..
Mam.. plz suggest me.. i m eagerly waiting for ur response... shal i add pepper powder instead of red chilli powder? ?...wil it taste gud?...becoz, recently from an article i came 2 knw tat using red chillies s nt gud for health..It plays major role n causing cancer..even our anchestors used pepper 2 make hot n spicy dishes..i too decided 2 follow their foot prints..so plz suggest me.. 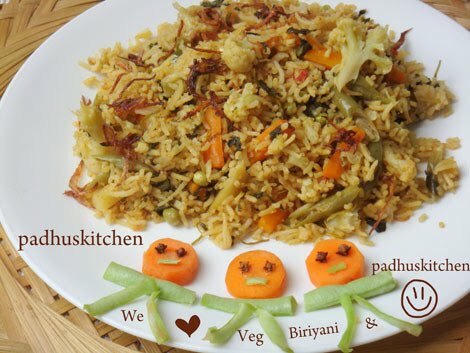 Wonderful and easy to prepare.Veg Biriyani,Thanks a LOT! You are my Guru. Nice recipe.....But if you include the ratio with number of servings it will be a perfect guide. I have mentioned in that box that it serves 2 .Kindly check that. Awesome recipes. Which brand of Rice cooker do u use ? Hey Padhu, whenever I cook biryani/pulao in pressure cooker using basmati rice, it always turns mushy :( I tried soaking the rice for 20 minutes, yet no luck. Do you have any tips to prevent this, and get perfect rice using basmati ? Try cooking it in a pan instead of pressure cooker. Add a tsp of lemon juice to the rice before cooking. Also try sauteing the drained rice in a tsp of ghee. This will also enhance the flavor of the biryani. Hi Thank u padhu for the enriched variety vwg dishes with each step. Hi, I tried this veg biriyani also. This was tasty. Thanks.. Thank you for sharing this recipe... I made it in a pan and it came out perfectly! Next time I'll make sure to add mint as I think that's the flavour I'm missing but it was delicious without it too, and my husband thought it was incredible. Thank you, Padhu! Very nice recipe! Vegan too if you skip the Ghee. Great flavors. What brand Biryani masala do you use? Can you also suggest a few other brands if the one you use is not available? Very nice recipe! Vegan too if you skip the Ghee. Great flavors. What brand Biryani masala do you use? Can you also suggest a few brands that I can buy @ Indian stores in the US? Can't the whole thing be done in kadai? I cooked everything in pressure cooker last time and the rice at the bottom got all mushy. Like your recipe for beetroot rice, won't it turn out well if I did the whole thing in kadai and don't transfer to cooker at all? Yes, it can be done in a kadai (with lid) also. Can you suggest a recipe for making briyani masala? Thanks. Ps. I’m in awe of your website and your detailed recipes. Use them a lot. Btw, we were classmates in Madurai, St. Joseph’s and TVSLakshmi. OMG!! This makes me so happy. The world is very small. I remember you very well. If I am right, you did English major with Raji and I have even come to your house in TVS nagar. You had a rose garden. So happy to keep in touch. Thank you so much for liking my recipes. Sure will soon post a good recipe for making biryani masala. Btw I have also started a Youtube channel recently. Do subscribe to that channel. I am sure you will not be regret.